NAIROBI – Kenya has called on the United Nations to accord equal support and prominence to Peace Missions in Africa as it does to those in other parts of the world, noting that the African Union Mission in Somalia (AMISOM) suffers perennial insufficient and unpredictable funding and lacks the necessary force multipliers. While appreciating the support and cooperation of the European Union in tackling the worrying peace and security threats such as terrorism and violent extremism, radicalization, piracy and organized crime in Africa, Kenya’s Foreign Affairs Chief Administrative Secretary, Hon. Ababu Namwamba urged the EU and other partners to foster even stronger partnerships and bridge existing gaps through investment in development projects in tandem with support for effective security infrastructure. CAS Ababu was addressing the inaugural African Union-European Union Ministerial meeting in Brussels, Belgium on 21-22 January 2019, where he is leading the Kenyan delegation. The two day consultations brought together Ministers from Africa and Europe to review progress made since the Abidjan Summit in 2017 and deliberated on peace, security and governance; Trade, investment and economic integration; and Multilateralism. Hon. Ababu stressed that with strong AU-EU partnership, Africa would be able to sustain the positive trajectory it is currently taking in the progressive actualization of the respective African Peace and Security Governance Architectures. This trajectory is exemplified by the peaceful transitions in Angola, South Africa, Ethiopia and Madagascar; the conclusion of the Revitalised Agreement on the Resolution of the Conflict in South Sudan; the resolution of the Eritrea-Ethiopia conflict as well as the restoration of friendly ties between Eritrea and Somalia” Ababu noted and added, “I welcome the steps taken to further institutionalise our cooperation within the existing frameworks and through the conclusion of the Memorandum of Understanding on Peace, Security and Governance.” Hon Ababu said and affirmed that “Africa has the will and the capacity to stop the vicious cycles of political crisis and conflict and set itself on the path to political stability and economic prosperity”. He lauded the Africa Continental Free Trade Area (AfCTA) as a key platform towards Africa’s Agenda 2063. CAS Ababu conveyed appreciation of the Government of Kenya and His Excellency President Uhuru Kenyatta for the outpouring of global support and messages of solidarity following the recent act of terrorism in Kenya. He assured the world that Kenya is safe and secure and remains a beacon of stability and symbol of economic vitality in the region. “The despicable attack on peace loving and innocent Kenyans and other nationalities has not dampened but in fact strengthened our resolve in the fight against terrorism and violent extremism in all its forms and manifestations in Kenya, the region and beyond,” CAS Ababu said. On trade, investment and economic integration, Hon Ababu re-affirmed Kenya’s commitment to investing in people and mobilizing investments for sustainable development and called for partnership with EU and other development and trade partners in the implementation of Kenya’s ‘Big four’ Agenda championed by President Uhuru Kenyatta’s that is focused on manufacturing, universal healthcare, affordable housing and food security. Hon Ababu implored both the African Union and the European Union to support Kenya’s bid for a non-permanent seat on the United Nations Security Council for the year 2021-2022 stressing that Kenya will bring rich experience to the council owing to its track record in conflict resolution and prevention as well as stabilization and resilience. 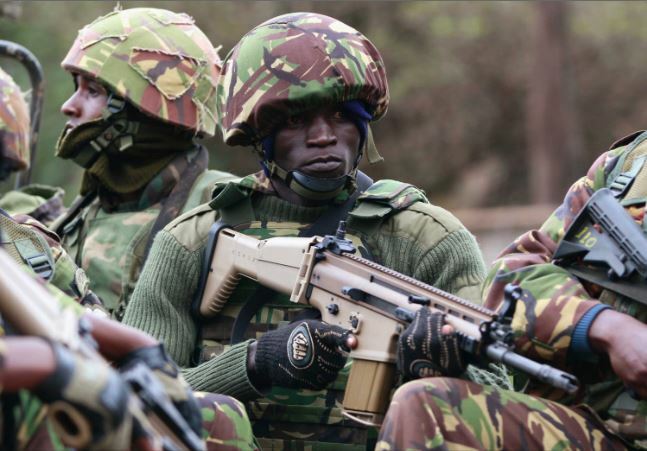 “Kenya is committed to the pursuance of global peace and security. “Our track record in conflict resolution and prevention as well as stabilisation and resilience is well known. We are therefore offering ourselves for a non-permanent seat at the United Nations Security Council for the year 2021-2022 to bring this rich experience to the Council. We hope to find favour within the African Union and the European Union in this bid,” CAS Ababu urged and concluded by highlighting the peace building credentials of President Uhuru Kenyatta “whose handshake and building bridges initiative for political stability and economic prosperity has become a regional and global reference phenomenon”. On the sidelines of the meeting, CAS Ababu held several bilateral meetings with foreign ministers from Greece, UK, Czech Republic, Romania and Spain as well as the European Director General for External Affairs. Discussions focused on matters of mutual interests between Kenya and the respective countries as well as Kenya’s role in regional and African peace, security and development initiatives. The CAS also contributed to consultations between the EU Vice President and High Representative for Foreign Affairs Federica Morgherini and the IGAD Ministers. Others in the Kenyan Delegation were Amb. Catherine Muigai, Amb. Jean Kimani, Amb. Johnstone Weru and Amb. Jacob Kaimenyi.